The Milwaukee Brewers visit Great American Ball Park on Monday to play the Cincinnati Reds. The probable starters are Wily Peralta for the Brewers and Anthony DeSclafani for the Reds. The Brewers have a 67-68-7 over/under record and a 76-66-0 run line mark, meaning they cover 54% of the time. The Reds are 74-67-0 against the run line and have a 75-56-10 over/under record. They cover the spread 53% of the time. The Brewers head into this matchup with a 63-79 record, including 24-43 on the road. Starting pitcher Wily Peralta has a 6-9 record with an earned run average of 5.47 and a WHIP of 1.59. He has 75 strikeouts over his 103.2 innings pitched and he has given up 127 hits so far this season. He has allowed 11 hits per 9 innings and he has a FIP of 5.27. The bullpen this year has an earned run average of 3.82 and they have given up 467 base hits on the year. Teams are hitting .252 against the bullpen while being struck out 428 times and walking 194 times this season. As a team, Milwaukee has allowed 9.09 hits per nine innings while striking out 7.37 batters per nine. They are 17th in the league in team earned run average at 4.20. The Brewers pitchers have collectively given up 1,270 base hits and 587 earned runs. They have allowed 163 home runs this season and they allow 1.2 homers per nine innings as a staff. Milwaukee as a pitching staff has walked 484 batters and struck out 1,030. They walk 3.5 men per 9 innings while striking out 7.4 per 9. They have a team WHIP of 1.40 and their FIP as a unit is 4.49. As a team, Milwaukee is batting .247, good for 24th in the league while putting together a .246 average away from home. The Brewers hold a .408 team slugging percentage and an on-base percentage of .328 which is good for 10th in baseball. They rank 27th in baseball with 8.12 hits per game. Jonathan Villar comes into this game hitting .296 and his on-base percentage is at .376. He has 154 hits this season along with 80 runs scored and 54 runs batted in. He's struck out 152 times and has walked 67 times. Ryan Braun is hitting .308 and he has an on-base percentage of .370. He has totaled 139 hits so far while scoring 72 runs and he's driven in 81. He has walked 42 times and has struck out 85 times. The Brewers have 1,153 hits, including 220 doubles and 165 home runs. They've stolen 159 bases while they've been thrown out stealing 48 times. Milwaukee has walked 544 times this season and they've struck out 1,341 times as a unit. They've left 963 men on base and have a team OPS of .736. They score 4.17 runs per contest and have scored a total of 592 runs so far this year. Cincinnati comes into this matchup with a 34-37 home record and a 59-82 overall mark. With an earned run average of 2.93, Anthony DeSclafani has a 8-3 record and a 1.16 WHIP. He has 94 strikeouts over the 107.1 innings he's pitched during which he has given up 102 hits. He has allowed 8.6 hits per nine innings and his FIP stands at 3.82. So far this season the bullpen has an earned run average of 5.00 and they have given up 495 base hits on the year. Teams are hitting .252 against the Reds bullpen while being struck out 455 times and walking 256 times this season. As a team, Cincinnati has allowed 9.14 hits per nine innings while striking out 7.7 batters per nine. They are 28th in the league in team earned run average at 4.92. The Reds pitchers as a team have surrendered 1,277 base knocks and 687 earned runs so far this season. They have given up 229 home runs this year and they give up 1.6 home runs per nine innings as a staff. Cincinnati as a staff has walked 548 hitters and struck out 1,076. They give up a walk 3.9 times per 9 innings while they strike out 7.7 per 9. Their team WHIP is 1.45 while their FIP as a staff is 5.27. As a team, they are batting .253, good for 20th in the league while putting together a .257 average at home. The Reds hold a .406 team slugging percentage and an on-base percentage of .315 which is good for 23rd in baseball. They rank 20th in baseball with 8.54 hits per contest. Joey Votto comes into this matchup batting .318 and he has an OBP of .436. He has 150 hits this year along with 87 runs scored and 82 RBI. He's struck out 113 times and has walked on 100 occasions. Zack Cozart is hitting .252 and he has an OBP of .308. He has collected 117 hits so far while he's scored 67 runs and drove in 50. He has earned a walk 37 times and has punched out 84 times. 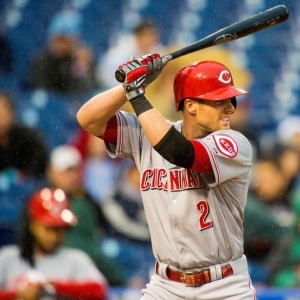 The Reds as a unit have 1,203 base hits, including 241 doubles and 146 homers. They have 122 stolen bases while they've been thrown out 44 times. Cincinnati as a team has walked 407 times this year and they have struck out 1,137 times. They've had 875 men left on base and have an OPS of .720. They score 4.4 runs per game and have totaled 620 runs so far this season.